In preparation for the month of November and my commitment to complete a 50,000 word novel in that time frame, I have been doing some casual reading on human psychology. What I’m interested in learning about is our motivations for doing things, our unspoken desires, and our nagging uncertainties. 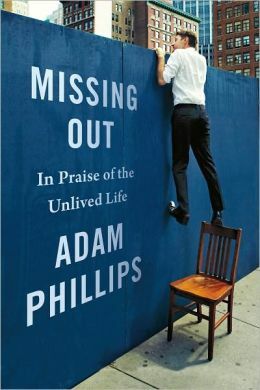 Most recently, I picked up Missing Out: In Praise of the Unlived Life by Adam Phillips. Image rights go to Barnes & Noble 2013. I was absolutely swept away by the intricate reasoning and extensive references to psychologists, Shakespearean tragedies and dramas, novel plots, and academic theories in this book. To keep my reflections brief, I will provide a quick sketch of each chapter, along with relevant quotes. If you have the time, though, I would encourage you to pick up this book from your local library and read it in its entirety. “Indeed, our lived lives might become a protracted mourning for, or an endless tantrum about, the lives we were unable to live” (Phillips, 2012, xii). “The myth of our potential can make of our lives a perpetual falling-short, a continual and continuing loss….even if we set aside the inevitable questions – How would we know if we had realized our potential? Where did we get our picture of this potential form?…we can’t imagine our lives without the unlived lives they contain” (Phillips, 2012, xiii). These two quotes nicely encapsulate the central thesis of Phillips’ argument; we are forever wishing for that ‘other’ life, the one just outside the bounds of possibility. Thinking about this ideal state, or set of states, makes our current life more bearable. Phillips asks throughout the book: What would our lives be like without this dual, fantasy world we so lust for? Satisfaction and frustration, two driving forces of Freudian and psychoanalysis, are raised time and again as the essential functions in this dream world. “Our solutions tell us what our problems are; our fantasy lives are not – or not necessarily – alternatives to, or refuges from, those real lives but an essential part of them” (Phillips, 2012, xvii). “Frustration is a state of self-doubt in which we cannot tolerate not knowing what we want, not knowing whether it is available, and not having it; …. Frustration is tempting because we crave false solutions; but “satisfaction is no more the solution to frustration than certainty is the solution to skepticism” (Phillips, 2012, p. 12). There are four different kinds of frustration: “the frustration of being deprived of something that has never existed; the frustration of being deprived of something one has never had (whether or not it exists); the frustration of being deprived of something one has had; and, finally, the frustration of being deprived of something one once had, but can’t have again” (Phillips, 2012, p. 20). This manifests as our constant search for the ideal person, the perfect job, the incredibly uplifting hobby. What you hope for and dream about never perfectly manifests itself as it does in your daydreams. Thus, we can never experience the state of satisfaction we so crave and, further, this frustration is an essential part of our lived reality. If something does not frustrate us, it is not real. “We can’t always afford to be recognized and to recognize ourselves and our needs because of the suffering entailed. To recognize our desire for what it is – as both dependent on others, and forbidden and therefore transgressive – reveals us as too unacceptable to ourselves, too conflicted, too endangered; it puts us, quite literally, at odds with ourselves” (Phillips, 2012, p. 35). We don’t want to be the only one in a crowd who doesn’t get a joke, the point of an argument, or a piece of art. It means that we’re an outlier, not a part of that group, and it’s humiliating and scary. Consequently, our super-ego commands us to ‘get it’ at all costs. In the relationship between child and parent, getting it is without words, and a parent who responds to the simple needs of the child ‘gets it’. Of course, as a child grows his/her needs become more complicated – the child wants to ‘get it’ and the parent may want to become blind to the ‘it’ their own child yearns for. In this sense, ‘not getting it’ is a what Jacques Lacan called our ‘passion for ignorance’, and is a place of safe refuge. However, getting or knowing another person entails certain elements of intimacy, ownership, control, and connection which we are loathe to relinquish entirely. “Which is why, as we shall see, getting away with things is among our most confounding experiences. If, as Freud remarks, the child’s first successful lie against his parents is his first moment of independence – the moment when he proves to himself that his parents cannot read his mind, and so are not omniscient deities – then it is also the first moment in which he recognizes his abandonment” (Phillips, 2012, p. 87). Critics and satirists are two examples of societal control for ensuring that other members of society do not get away with it, whatever ‘it’ may be. In the days of Shakespearean tragedies and dramas, one did not get away with it; these stories were didactic and punishment for transgression was rampant. Phillips identifies the growth of the phrase as American slang, and outlines how it promotes “a kind of triumphalism, a beating of the system, a getting-ahead in whatever way possible” that goes hand-in-hand with an individualistic, materialistic society (Phillips, 2012, pg. 94). Hence, we have to wonder about the details of governments, authors, and everyday, average folk ‘getting away with it’. “The project, so to speak, is to stop the relentless transmission of misery” (Phillips, 2012, pg. 112). Although we always want to ‘get out’ of our current situation and into a better one, there are many unknown hazards in this potential new state and, further, we have to wonder why we so badly want to escape the life we’re in now. To this, Phillips’ proposes an idea and a definition: “We think we know more about the experiences we don’t have than about the experiences that we do have, ‘frustration’ being our word for the experience of not having an experience” (Phillips, 2012, pg. 117). This draws nicely back into the book’s theory about our unlived lives – our motivation for living two duals lives (one in reality, the other in imagination) has much to do with our motivating state of frustration and the illusion that we know the future of our current, real life and the trajectory of the fantasy life we could also be living (even though we’ve never had those experiences). There are several other chapters, and many more nuanced arguments, which make this book a compelling and mind-bending read. If you’re seeking to identify some of the underlying drivers for human behavior, or suss out some of humanity’s deepest nagging anxieties, this is definitely one avenue to get you thinking.